The United States Drug Enforcement Administration (DEA) recently evoked its emergency scheduling authority to control five chemicals used to make so-called "synthetic marijuana" products. Except as authorized by law, this action makes possessing and selling these chemicals or the products that contain them illegal in the United States. The Drug Enforcement Administration recently temporarily banned certain chemicals that are used in legal synthetic drugs known as "bath salts", calling the chemicals an "imminent hazard" to the public. The DEA describes "bath salts", which have nothing in common with products long-used in bathing, as a sort of imitation cocaine or LSD – a substance that while legal, has not been approved by the FDA for human consumption and has been linked to violent, sometimes deadly outbursts by users. Varieties of "bath salts" are sold under different labels in corner stores across the U.S. as well as online and have prompted thousands of calls to Poison Control nationwide. Call your local MMC office Today to learn more about these dangerous drugs and chemicals that are sold in local convenience stores and novelty shops nationwide! Salem, Oregon: police say a drunk driver who caused a crash that cut power to more than 2,000 customers was too drunk to go to jail. Ohioville, PA: Man on lawn tractor charged with drunken driving. Russia: Russian flight navigator was drunk on vodka when plane crashed killing 47. The Office of National Drug Control Policy claims that drugs and alcohol cost taxpayers more than $300 billion annually in preventable health care costs, extra law enforcement, auto crashes, crime and lost job productivity. Mobile Medical Corporation's Random Drug Testing with Saliva Alcohol Testing can help employers to stem the costs of "working" under the influence. Pittsburgh, PA based Mobile Medical Corporation (MMC) is an industry leader in providing customized workplace drug and alcohol testing and credential tracking solutions. Contact MMC today and ask about Instant Saliva Alcohol Testing! Mobile Medical Corporation applauds the construction workers at ground zero for their hard work and is proud to be part of the safe rebuilding effort at Ground Zero. 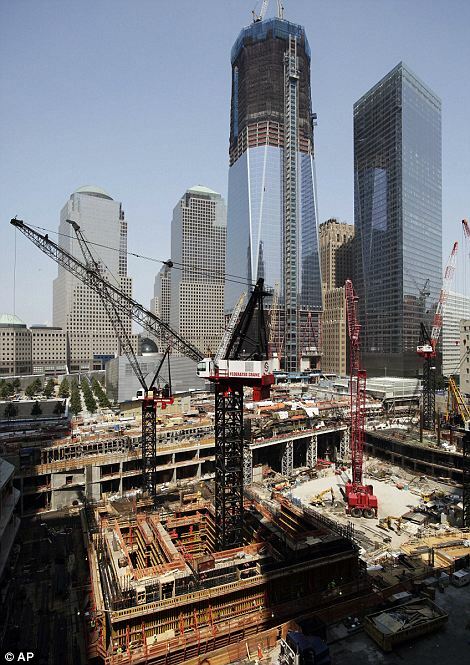 One of the first of six skyscrapers that will be on the site altogether is the Freedom Tower also known as One World Trade Center. One World Trade Center now stands at 78 storeys and will eventually soar to 104 floors, or 1,776ft, becoming the tallest building in Manhattan when it’s completed in 2013. MMC's Mobile On-site Medical Testing Unit contributes to the safety protocols of the construction efforts by providing drug testing services to certain contractors who are working on Ground Zero construction projects. When it comes to compliant and multi-leveled substance abuse testing programs, Pittsburgh based Mobile Medical Corporation (MMC) offers a vast array of compatible screening solutions designed to meet any Drug Free Workplace initiative nationwide. MMC's certified collection technicians all pass a rigorous DATIA training course. MMC partners with the largest accredited laboratories in the nation which allows us to truly be involved from start to finish on every drug test we perform for our clients. All of Mobile Medical Corporation's laboratory partners are certified by the Substance Abuse and Mental Health Services Administration (SAMHSA) to meet all strict government requirements.